Chinese winged orbital launch vehicle. The Chang Cheng 1 (Great Wall 1) vertical takeoff / horizontal landing two-stage space shuttle was a compromise design created jointly by Shanghai Astronautics Bureau 805 (now the Shanghai Academy of Spaceflight Technology) and Institute 604 of the Air Ministry in 1988. 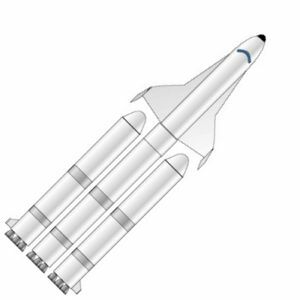 An expendable booster, consisting of three of Shanghai's planned liquid oxygen/kerosene modular boosters, would boost the winged second stage shuttle to a high altitude. 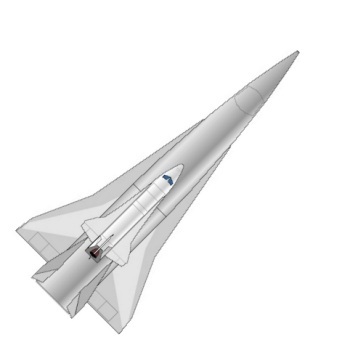 The engines of the winged shuttle stage would take it to orbit. This approach would allow a first flight to be made in 2008. Each of the modular booster stages designed by Shanghai were 4.5 m in diameter and 29 m long, with a mass of 330 metric tons. The shuttle had a wingspan of 17 m, a length of 24 m, and a 4.5 m fuselage diameter. It was essentially a 2/3 scale version of the American shuttle, with half the wing area and launch mass. It is probable that the spacecraft used the same propulsion systems as the upper stage of the Shanghai upper stage expendable system. This would mean the upper stage was around 57 metric tons in mass, with just over half of that being propellant, yielding a net payload to orbit of 6 metric tons plus a crew of two. A rearguard action was fought to try to include new booster development. In October 1993 the Shanghai Astronautics Bureau proposed development of six large carrier rockets and eight new spacecraft, including a manned one, for inclusion in the Eight and Ninth Five Year Economic Plans. But this was not approved. Shanghai's program for development of a new generation of liquid oxygen / kerosene rockets was shelved, and those resources were instead put into the development of large solid motors for military use. This marked the abandonment of the last design element of the Chang Cheng 1 design concept. Stage 0. 2 x Project 921-1. Gross Mass: 306,000 kg (674,000 lb). Empty Mass: 20,000 kg (44,000 lb). Thrust (vac): 5,406.141 kN (1,215,349 lbf). Isp: 330 sec. Burn time: 170 sec. Isp(sl): 293 sec. Diameter: 4.50 m (14.70 ft). Span: 7.50 m (24.60 ft). Length: 29.00 m (95.00 ft). Propellants: Lox/Kerosene. No Engines: 4. Status: Study 1992. Comments: Engine chamber pressure 13 to 15 Mpa. Stage 1. 1 x Project 921-1. Gross Mass: 306,000 kg (674,000 lb). Empty Mass: 20,000 kg (44,000 lb). Thrust (vac): 5,406.141 kN (1,215,349 lbf). Isp: 330 sec. Burn time: 170 sec. Isp(sl): 293 sec. Diameter: 4.50 m (14.70 ft). Span: 7.50 m (24.60 ft). Length: 29.00 m (95.00 ft). Propellants: Lox/Kerosene. No Engines: 4. Status: Study 1992. Comments: Engine chamber pressure 13 to 15 Mpa. Stage 2. 1 x Chang Cheng 1. Gross Mass: 57,000 kg (125,000 lb). Empty Mass: 30,000 kg (66,000 lb). Thrust (vac): 490.000 kN (110,150 lbf). Isp: 230 sec. Burn time: 430 sec. Diameter: 4.50 m (14.70 ft). Span: 17.00 m (55.00 ft). Length: 24.00 m (78.00 ft). Propellants: Lox/LH2. No Engines: 1. Status: Study 1992. Comments: All characteristics except dimensions estimated, on assumption that stage used same propulsion systems as Shanghai upper stage. Chang Cheng stage 1 LOx/LH2 propellant rocket stage. All characteristics except dimensions estimated, on assumption that stage used same propulsion systems as Shanghai upper stage. Family: orbital launch vehicle, Winged. Country: China. Stages: Project 921-1, Chang Cheng stage 1. Agency: Institute 601. Bibliography: 1791, 531.